Today we’re rolling out a major update to the Segment app, designed to clarify how your data flows through Segment. Product Naming — Data now flows from your Sources to your Destinations. Destinations combine data warehouses and other integrations for analytics, email, and marketing. 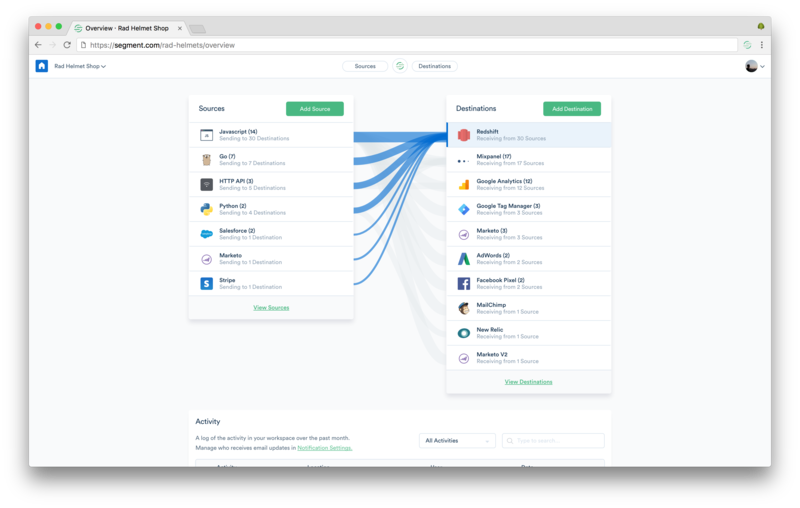 App Design — The new design reflects the flow of your data from Sources to Destinations across the Navigation, Overview page, and more. Now you can easily scan the list of Sources and Destinations you have connected to Segment. Your Sources are all still visible on the Sources page, but the page has been switched from a grid layout to a vertical table layout that is easier to read. Your old Warehouses view has also been switched from a grid layout to a vertical table layout that is easier to read… and now includes all your existing integrations as well as warehouses. You can still enable a destination, use the debugger stream, and inspect your schema in the same place as before on every source. Over the next few weeks you'll see improvements ship throughout the app as we finish updating it to show how data flows from your Sources to Destinations. We believe the new updates will clarify how Segment is working for you, and improve your experience using Segment. If you have any questions or feedback, please let us know!